The cell biology field is full of creative people and just as many creative approaches to doing great science. As a graduate student and aspiring cell biologist, I have always been curious about how people approach the multifaceted career of running a research lab. Unfortunately, we trainees rarely have opportunities to ask detailed questions about how established cell biologists run their labs and make discoveries. Dr. Amy Gladfelter gamely agreed to be my first guinea pig for this series. 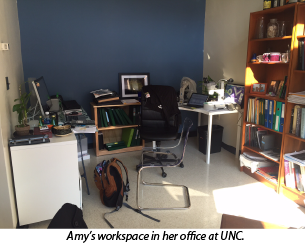 Amy is an associate professor in the Department of Biology at the University of North Carolina-Chapel Hill. She is also an HHMI Faculty Scholar and a 2015 ASCB WICB Award winner. Amy and her lab study how cells are organized in space and time, using cutting-edge microscopy and computational techniques, along with other innovative approaches. Thanks, Amy for telling us about how you work! We are interested in how the physical properties of molecules contribute to cell organization and dynamics. In particular we are interested in how cells pattern their cytosol and how they perceive their shape. We use a variety of microscopy methods, genetics, biochemical reconstitution, and biophysical approaches in a number of different cell systems including fungi and mammalian cells. This is tough—I am so excited about too many things we are working on right now! I am really excited by and stimulated by thinking about RNA and how features of RNAs influence the material properties of cell structures. I am also really interested in how cell structure information crosses scales and recently we have thought about how septin filaments allow the nanometer and micrometer scales to be linked, but I’m curious about other mechanisms beyond polymerization that allow for scaling across length scales. I just moved my lab from Dartmouth, where I was for 10 years, to UNC a few months ago so many of my challenges are very finite and revolve around logistics of getting microscopes assembled. My bigger picture challenge remains how to find the right people for the team so that we have a blend of talents, training, and personalities that make this a stimulating lab for discovery. Don’t question if you are doing something the right way—just use intuition, research options, and act without too much anguish. Always wait 24 hours before saying yes to something. I probably need a lot more of these—I don’t really know that I have many but I do try to walk to work most days and this takes care of exercise and thinking and commuting in one step so to speak. My moleskin notebook. I find I have to still have a paper list although I do use a digital calendar. Something about physically crossing things off it with a pen is critical to my mental equilibrium. Slack has changed the way I communicate with my lab. Now I don’t have to wade through my email for messages from my people and instead sharing images, movies, gels, ideas, planning, etc., all happens through series of conversations on Slack. Without having to see all the many things in my inbox, I can prioritize needs, issues, and communications with my lab. It lets me focus on the work of my groups without getting lost and distracted in the myriad of requests in email. My apple corer from Ikea. I use it every day to cut apples very quickly for kid’s lunches. Take a walk each day and look at the trees and the sky. Tim Mitchison, and I admire how he continues to work at the bench—generating ideas, playing, and gazing in the microscope despite all the pulls on time. I like fiction that is as much about how the sentences are built as the stories themselves. I love to garden and I like thinking about what plants are going into my new garden in Chapel Hill. I try to be in bed reading by 11 and up at 6. In some phases, I wake at 4:30 to work before the family awakes but this is seasonal behavior. What would you do if you weren’t doing research every day? My plan B careers that I still consider on overwhelming days are to be a writer, to be a midwife, or to run a plant nursery. Eva Nogales—I really admire her science and her humanity. We all are juggling many balls at one time. Learn what balls are made of glass and will shatter if dropped and learn which once are made of rubber and will bounce. Michelle Momany of University of Georgia told me this.